Why didn’t I just turn on the lights? When I was a child, my father might send me to the basement. Perhaps to retrieve an item from the deep-freeze in the far back of the boiler room, or maybe to grab some item from storage. It was always so dark down there. I don’t know why I didn’t just turn on the lights. My dangerously acute imagination would fabricate a demon in the shadows. A demon that was sure to pounce on me the moment I turned my back to him. I would walk to the back of the boiler room and retrieve the item. But as I turned to leave, I always felt his dark presence behind me. I would run with all my might back up the stairs, terrified the demon might give chase. I could feel the chills of death breathing on my neck as I ran from him. Why didn’t I turn the lights on? Every time I made it back to the top of the stairs – safe in the light of the kitchen – I would turn and peer back down into the darkness. I would smirk to myself. Another victory over hell. Then I would slightly blush, especially if my mother happened to see my panicked burst into the kitchen. I knew the fear was irrational, but that made the feeling of it no less real. There was never anything down there. Why didn’t I just turn the lights on? Yet without fail, every time I would descend into the darkness, I would go through the same terrifying process, until one day I called the demon’s bluff. I walked down the stairs at a steady pace. I went to the back of the dark boiler room, past the deep freeze, and to some shelves covered by a heavy curtain. You could not go deeper into the darkness than that. I lifted my hand to my face – only inches away – and I could not see even the slightest shape of it. I breathed on it to assure myself it was indeed there. This was total darkness. I pulled the curtain aside, and slid between the curtain and the shelves. 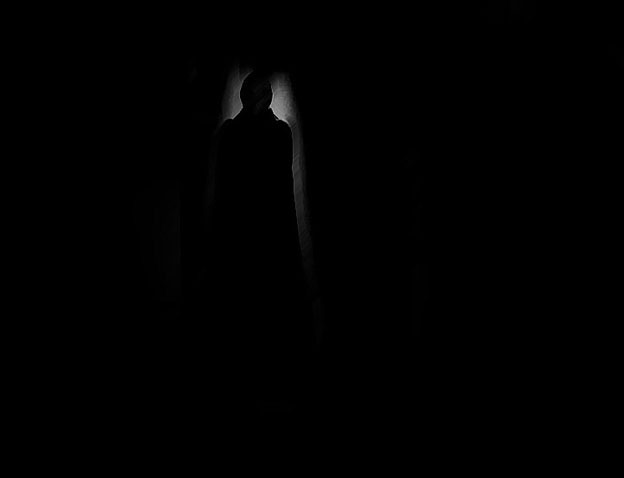 The curtain’s weight pressed against my young body, but not nearly as much as the overwhelming darkness did. I just stood their, waiting for the demon. I could feel my body grow cold, and my hairs to stand on end. However, the longer I stood there, indulging my fear and taunting the demon with my bold determination to stand my ground, the more I grew convinced that I was indeed alone in the darkness. “What? Is that it? Nothing?” I whispered arrogantly to the darkness. I pulled the curtain back again and stepped into the middle of the boiler room. I put my hands on my hips and snorted congratulatory to myself. I walked from the boiler room to the base of the stairs with confidence. I took my sweet time with each bold step, and before beginning my ascent to the kitchen, I turned to the darkness. “I win.” I said firmly, and just loud enough to reach the farthest corner of the basement. I turned again, put my right foot on the first step, and immediately felt that familiar chill on my neck again. Why didn’t I turn on the lights?